Diabetes is one of the most common chronic conditions in the United States, with approximately 29 million people affected. With just under 10 percent of people in the US having diabetes and type 2’s prevalence in people over 45, families providing senior care in Harrisburg may be helping a loved one adjust to a diabetes-friendly lifestyle. Knowing a few crucial facts about the condition can help ensure you’re able to keep your loved one healthy. Almost one third of people who have the disease don’t know they are diabetic. Type 2 diabetes often develops gradually, with many individuals having prediabetes for years before actually developing the condition. 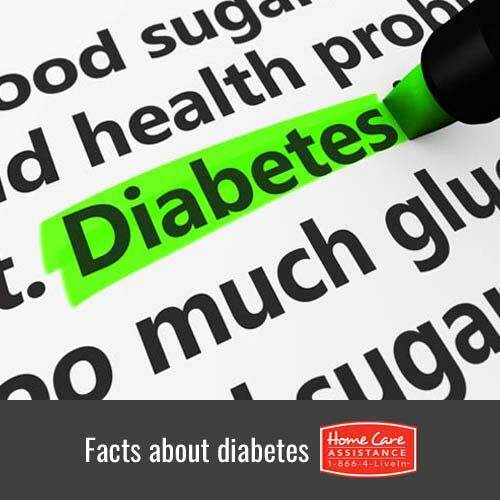 Once someone actually has diabetes, it is still often symptomless until the blood sugar becomes highly elevated. Many seniors who know they have the condition don’t monitor it as closely as they should when the symptoms are minor and, thus, may have much higher blood sugar than they realize. Checking your loved one’s blood sugar regularly is important to ensure diabetes does not get a foothold and become worse. Whether they have had diabetes longer, their body is more sensitive to the destruction diabetes causes, or a combination of both, seniors are far more likely to develop diabetic complications than young or middle-aged adults. This can be especially problematic for your loved one because diabetic complications do seem to affect seniors more and, oftentimes, seniors do not recover as easily as younger people. Diabetic meal guidelines have changed considerably in the last couple of decades. These days, focus is on eating low carb since carbohydrates turn into sugar in the blood. However, science is suggesting non-diabetics should be eating low carb and low sugar diets as well. Studies show seniors are less likely to regularly have diabetes-friendly meals, but are at the highest risk for complications without proper nutrition. Luckily, there are a lot of recipes perfect for people both with and without diabetes, so having the condition doesn’t mean your loved one’s diet needs to be bland or that you’ll need to prepare a special meal for him or her. Because diabetes complications are especially common in seniors, often worsening due to age and the length of time a person has had the condition, doing all you can to reduce the severity of your loved one’s complications is important. One thing to consider is the majority of people who have type 2 diabetes are overweight or obese and underactive. Harrisburg caregivers can introduce goals into your loved one’s life to lose 10-15 pounds (if his or her doctor approves) and to partake in 30 minutes of moderate exercise daily such as a brisk walk. Studies show exercise and weight loss can strongly reduce complications from diabetes and the amount of diabetes medicine your loved one needs. Researchers are finding strong correlations amongst seniors who have diabetes and the development of other chronic conditions common to their age group. For instance, seniors who have diabetes are twice as likely to develop heart disease compared to those who have no history of diabetes. Providing good care for your loved one means keeping a close eye out for other common age-related conditions and treating them immediately if they do arise. Interested in learning more about diabetes and how high-quality home care can promote your loved one’s quality of life? Turn to Home Care Assistance for compassionate and expertly trained caregivers who are available to assist your loved one 24/7. We also offer specialized Alzheimer’s, dementia, and Parkinson’s care in Harrisburg. For more information, call one of our knowledgeable Care Managers at (717) 540-4663 to schedule a free consultation. What Rare Diseases Are Seniors Susceptible To?